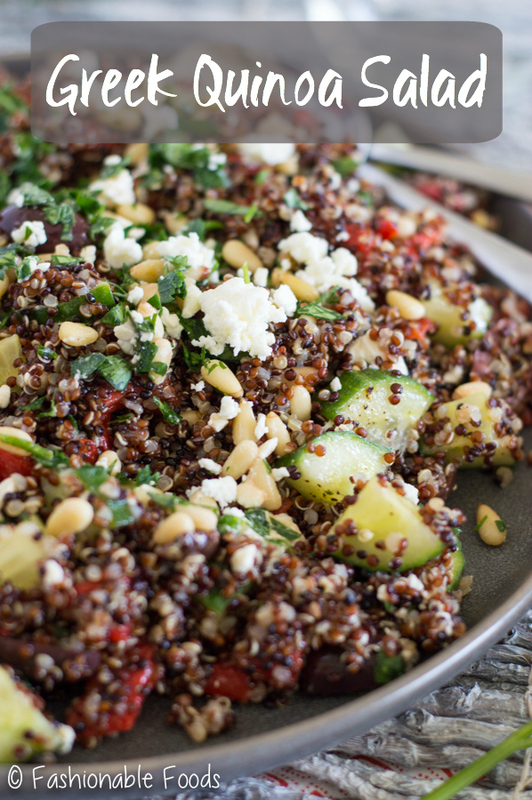 Quinoa is combined with a flavorful mix of vegetables, olives, cheese, parsley, and is then tossed with a light lemon dressing to make up this delicious Greek quinoa salad. A pinch of dried oregano adds earthiness while fresh parsley adds freshness. 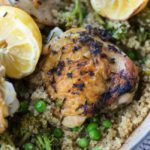 *This recipe was originally posted in 2014 as a couscous salad. Having to be gluten-free, couscous is no longer an option and I haven’t been able to easily find gluten-free couscous. So, I decided to update the recipe to use quinoa. I actually prefer the quinoa since it has more fiber and protein! If you don’t have to eat gluten-free, you can use couscous if you like. I often get asked what my favorite, go-to side dishes are that can accompany a variety of entrees. One of my favorites is quinoa! 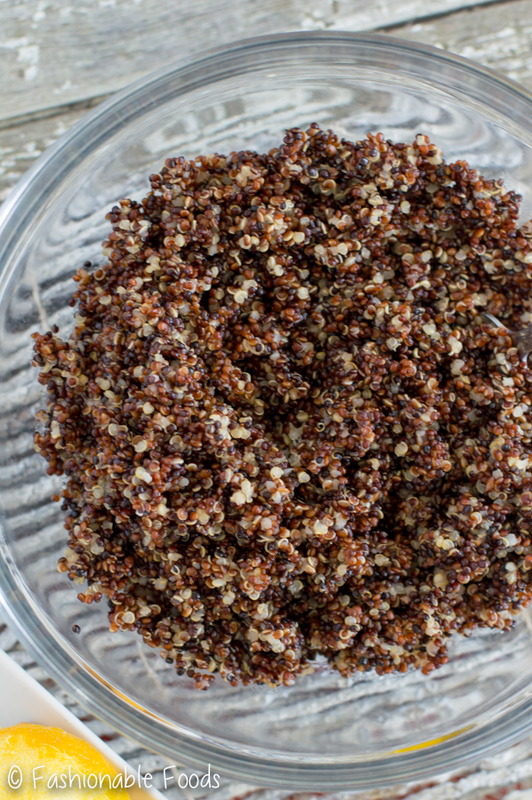 You can make a big batch of quinoa and then do different things with it all week long. 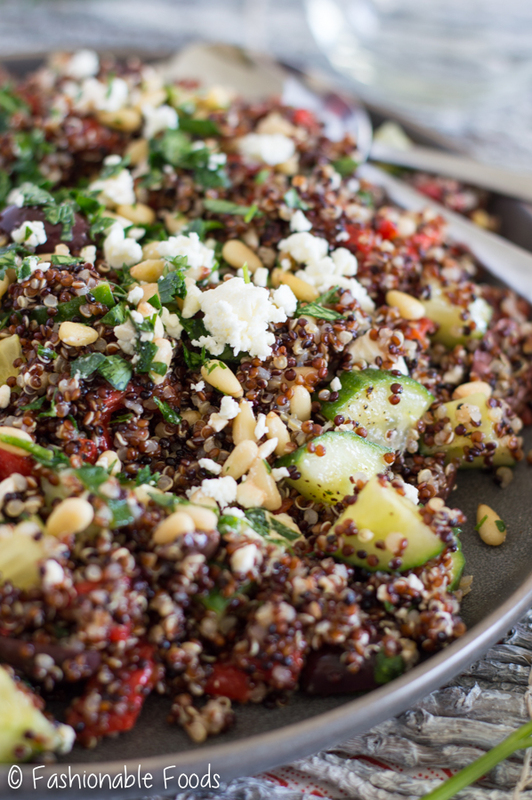 Quinoa makes a great side dish, but is also the perfect base for salads. 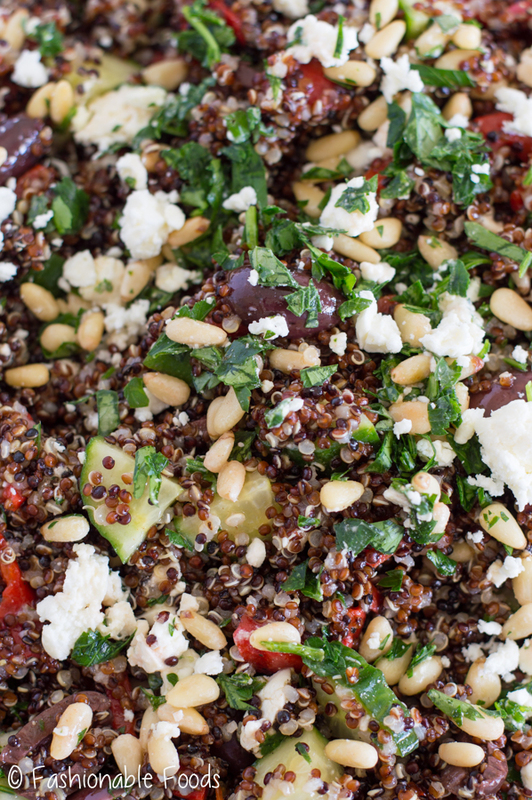 Today I’m sharing with you a Greek-inspired quinoa salad. Sweet peppers, tangy olives, crisp cucumbers, buttery pine nuts, and salty feta cheese work perfectly tossed with quinoa and the light lemon dressing. I like the salad served at room temperature, but it’s also great warm, or chilled. 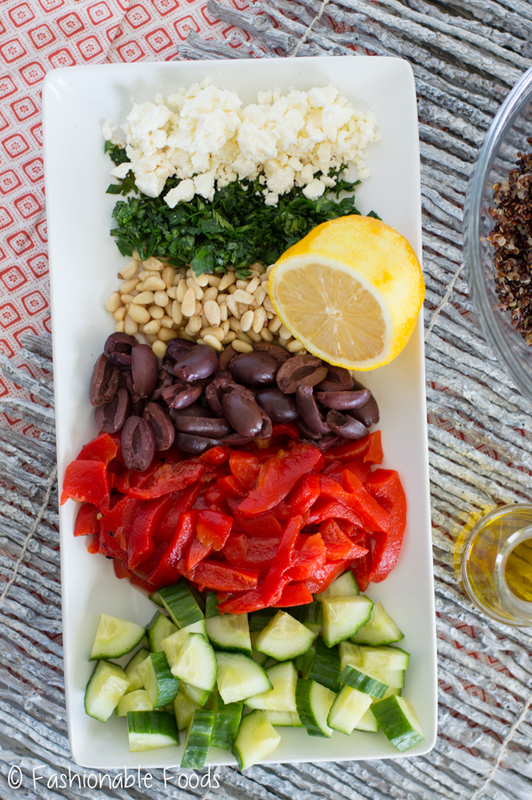 This Greek quinoa salad is really simple to put together, just cook some quinoa, chop your veggies, and toss it all together. It really is that easy and the flavor just gets better as it sits. 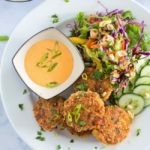 I love having this salad around for a quick and healthy lunch, but it’s also great as a side dish to whatever protein you’re cooking up. 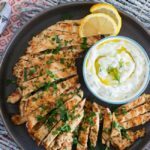 You could also enjoy it as a light dinner, or add some shredded chicken or tuna to amp up the protein. I love dishes that can work as a side, but that can also be substantial enough to stand alone as an entrée. This salad is a great one to have in your fridge for busy weeknights and quick lunches. I highly suggest that you whip up a batch of this delicious salad – you won’t be sorry! 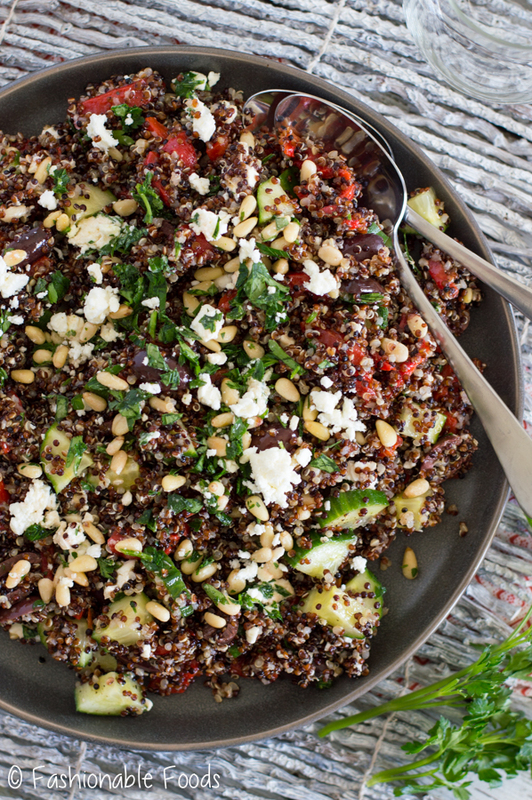 Quinoa is combined with a flavorful mix of vegetables, olives, cheese, parsley, and is then tossed with a light lemon dressing to make up this delicious Greek salad. A pinch of dried oregano adds earthiness while fresh parsley adds freshness. 1 Cup Quinoa,I used tricolor, but regular works too! Combine the quinoa with 1 ¼ cups water in a pot. Bring the mixture a boil and then reduce the heat to low and cook for 10-15 minutes, or until all of the liquid is absorbed. Shut off the heat and let stand for 5 minutes, fluff with a fork and transfer it to a large bowl, allow it to cool slightly. Stir in the salt, pepper, oregano, olive oil, and lemon juice; mix well. Add in the rest of the ingredients and mix well, serve chilled or at room temperature. Extra-virgin olive oil is important in salad dressings in that it provides a lot of flavor that light or low-flavor oils would not provide. Be sure to use a good-quality one for this recipe! This is versatile recipe - feel free to omit or add different ingredients to suit your tastes! I love that quinoa is so versatile. Like you said it’s perfect as a side or an entree with all of these additions. And it’s easy to make so that’s a bonus for sure!